The Seagull Entourage CW GT QI Acoustic-Electric Guitar offers an exceptional value for players of all levels. 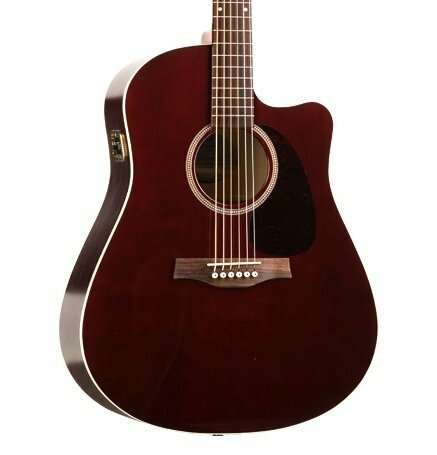 This finely crafted Canadian made instrument features a select pressure tested solid cedar top and wild cherry back & sides. Also this model features the Seagull Slim neck with a 1-3/4" nut width, which is great for players who are more accustomed to a more traditional nut width. The Entourage CW GT QI includes onboard Quantum I electronics with a built-in tuner and the added feature of a cutaway in the body for easy access to the upper frets on the neck. The Godin EPM Quantum acoustic guitar system is simple in design and outstanding in performance. This single source system features an exceptionally responsive saddle transducer carefully matched to side mount electronics with rotary volume, bass, and treble controls. The electronics and controls are packaged in a small and easy to use format complemented with a finely crafted pewter cover plate. In combination with the transducer, the EQ control range and frequency content have been specifically contoured to provide a very rich and full sound reproduction resulting in performance seen only in far more complex systems. The Godin Q1 also includes a built-in high quality digital chromatic tuner with LED display.